ALONG THE MAIN ROAD between Sarrià and Barcelona you’ll find a generic looking multi-storied apartment block. It is one of a number of similar looking buildings in the area, each one of which could easily pass as something you’d have seen in a 1980s holiday brochure, within the pages for resorts along the Costa Dorada. The building itself isn’t extraordinary, but the view from the balcony used to be. Today the view is a relatively pleasant one, one which offers a glimpse of a peaceful patch of greenery, a view of an urban park, of somewhere to sit in the shade of the tree-lined avenues and read a book on a warm day. It is instead the view that it used to offer that reverberates most profoundly, however. Up until its closure in 1997, the view on offer to the residents of the upper floors of those apartments was that of the Estadi de Sarrià, the former home of RCD Espanyol. For a seven-day stretch, a span of time that straddled the end of June and beginning of July 1982, the Estadi de Sarrià was handed over to FIFA for the purposes of hosting three games at the World Cup finals. Group C, in the second round group stages of España 82, essentially turned out to be an accidental group. While Brazil, the projected winners of the first round, were fully expected to be playing games at the Estadi de Sarrià, their opponents weren’t anticipated to be fellow World Cup winners. Italy’s inability to pick up a win during the first round of group games, coupled with Argentina slipping to a defeat to Belgium in the opening game of the tournament, meant that Brazil found no advantage in topping their own group. The Estadi de Sarrià was the unwitting recipient of a trio of heavyweight footballing nations. In a footballing city shared with the imposing Camp Nou, the Sarrià would deliver the most remarkable and atmospheric games of the tournament, while in comparison, Poland, Belgium and the Soviet Union would rattle around in the cavernous home of FC Barcelona. The Estadi de Sarrià created a cauldron effect, which went a long way to dictating how the games played there evolved. Brazil, Italy and Argentina may well have served up an entirely different set of games had they been played out across town at the Camp Nou. Some sporting events are inextricably linked to their surroundings. Ali-Foreman wouldn’t seem right anywhere other than in Kinshasa. Ali-Frazer – part three – wouldn’t seem right anywhere other than in Quezon City. Brazil-Italy-Argentina wouldn’t seem right anywhere other than the Estadi de Sarrià. For Ali-Foreman-Frazer in 1974-75, the Sarrià at España 82 gave you Zico-Rossi-Maradona. It was supposed to be the precursor to the coronation of the new king, and the new king was meant to be Zico. At 29, Zico was at the peak of his powers, an irresistible force. Diego Maradona, at 21, had his career ahead of him and early lessons to be learnt. Paulo Rossi, at 25, was fresh out of a two-year ban for his perceived part in the Totonero scandal, which rocked Italian football in 1980. While Rossi was serving his ban, Zico was winning the Copa Libertadores, the World Club Championship and back-to-back South American Footballer of the Year awards. España 82 was to be the crowning glory. The cream of Europe had courted Flamengo for Zico’s signature, but he was part of the last great generation of Brazilian footballers who didn’t automatically transfer their talents to Serie A and La Liga as soon as they blipped onto the radar. Sometimes by choice, but also sometimes at the behest of the Brazilian military government, the nation’s finest players remained within the domestic club game, rather than seek the riches of Mediterranean Europe. The ballast of Zico’s prime at club level was played out in the Rio State Championship and the Brazilian Serie A. Often billed as ‘The White Pelé’, the predominantly right-footed Zico was blessed with skill in abundance, but he was much more direct and would attack at greater sustained pace than his legendary predecessor in the yellow number 10 shirt. 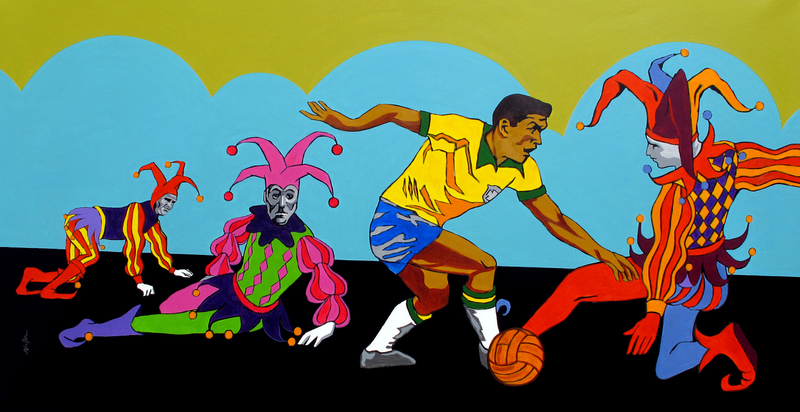 While the España 82 and Mexico 86 vintages of the Brazilian national side are widely seen as the last stands of the samba style ethos, as directed by the bold brilliance of Telê Santana, Zico was vaguely at odds with the slow build-up play that was conducted on the pitch by the late, great Sócrates. As much as he was undoubtedly South American, Zico could easily have passed for a Southern European player in his style of on-ball exuberance. If you need a Premier League equivalent to serve as a style comparison, then you would perhaps be looking towards Gianfranco Zola. Zico was a player infused with a startling natural talent, but he was also the owner of a lack of patience at times; a lack of patience he channelled in the most positive of ways. The laconic Socrates and the driving will of Zico were the perfect foil for one another. Orbited by the outrageously talented Falcão, Serginho, Cerezo and Éder, it was as if Santana’s Brazil were pre-ordained to be crowned world champions for the fourth time. Destiny was calling out to Brazil at España 82, in the same way destiny called out to Hungary in 1954 and Holland in 1974. As was the case in Switzerland and West Germany, however, in Spain it would be a destiny unrequited. At España 82, Zico was the baton carrier, the custodian of the hopes of a nation. 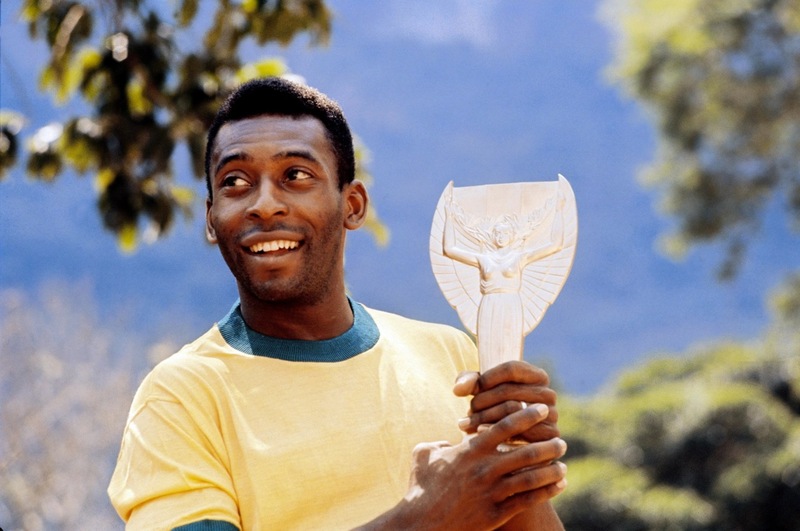 Four years earlier, in Argentina, he had shared the burden, one of a number of pretenders to the throne Pelé had once sat upon. Rivellino was, at 32, leading the side as captain, while Zico battled for elbow room in the side with the likes of Zé Sérgio, Dirceu and the man who many tipped to be the new king of Brazilian football, Reinaldo. Argentina 78 acted as a marker for what came four years later. Brazil might well have gone all the way to glory there and then under the guidance of the tragic Cláudio Coutinho. Controversy reigned, however. Against Sweden, Zico headed what looked to be a late winner, only for the notorious Clive Thomas to disallow the goal. The Welshman claimed to have blown the whistle for full-time in the seconds between the last-minute corner being taken and the ball finding the back of the Sweden net via Zico’s head. Worse was to come when, during the second round group stages in their fierce rival’s back garden, split kick-off times for the decisive games had left Argentina knowing exactly what they had to do to pip Brazil for a place in the final. With a four-goal margin of victory required, Argentina ran up what is a still much debated and highly suspect 6-0 scoreline against Peru. It was a greatly refined and far more focussed side by the time Brazil and Zico reached España 82. 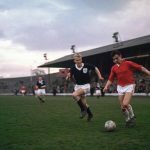 No longer hamstrung by the lingering ghosts of Mexico 70, and with a settled first choice line-up, they tore through the Soviet Union, Scotland and New Zealand, scoring 10 goals in the process. This was double the amount of goals they’d managed during the first round group stages of their two previous World Cups put together. Zico netted three of them. Brazil had finally rediscovered themselves in the wake of their unusually physical approach to the defence of their title in 1974, and the comparatively tentative nature of their re-emergence as artisans in 1978. Zico was central to it all. Then came the Estadi de Sarrià. With Argentina defeated by both Italy and Brazil, it left that legendary and pivotal game between the two to decide who would go on to reach the semi-finals. Brazil, with a goal advantage, needed just a draw. On target yet again against Argentina, Zico’s importance and form was such that the enigmatically brutal Claudio Gentile was deployed to man-mark Brazil’s number 10. Zico simply dropped deeper in a bid to pull Gentile away from his comfort zone and create space for others to exploit. Sócrates, Júnior and Oscar all joined in with what was at times an all-out assault on the Italian penalty area, the Azzurri springing forward on the counter-attack in response. A pattern of play provoked by Rossi opening the scoring after just five minutes. Zico provided the equaliser, however, twisting and turning Gentile before playing in Sócrates to level the game. Yet Rossi, after a sluggish start to the tournament, clicked into gear in emphatic fashion. He pounced on a defensive error from Cerezo to make it 2-1, before a moment of genius from Falcão put the game at parity once more. Despite Brazil’s mesmerising attacking football, they contrived to spend just 24 minutes of this game on level terms and never once lead. An unnecessarily conceded corner was eventually the source of Rossi and Italy’s winning goal. Zico left the pitch at full-time with a haunted look on his face. The best team in the tournament were unable to continue towards what was supposed to be their date with destiny, undone by a combination of the lethal finishing of Rossi and their own defensive frailties. Within a year of that game, Zico was heading for Italy. At the age of 30, Serie A finally captured a man it had coveted for almost a decade. His advancing years meant that the heavyweights of Milan, Turin and Rome shied away from the outlay required to obtain his services. AC Milan and AS Roma in particular had previously made serious attempts to sign him, but it was the lesser lights of Udinese who met all the demands required to clinch his signature. Teaming up at the Stadio Friuli with his international team-mate Edinho, the man who would captain Brazil at Mexico 86, and also the legendary Franco Causio, who had been an unused substitute for Italy against Brazil at the Estadi de Sarrià, the supporters of the Bianconeri Friuliani fell for Zico from the very start. Zico spent two seasons in the Udine, with only Michel Platini scoring more goals during that debut campaign of 1983-84. The switch from Flamengo was seamless, yet the successes Zico enjoyed at Udinese were all personal ones. Collective glory proved beyond even his powers of inspiration. Regardless of major honours remaining elusive in Italy, Zico thrived in the rarefied air of Serie A. Weekly duels with the finest playmakers in world football kept supporters enraptured. In Zico they had found their answer to the likes of Platini. Zico’s last Serie A game in front of the Udinese faithful was a fitting one. Napoli were the visitors and Zico’s farewell was to be a face-off with Maradona. It was a game which tilted one way and then the other, with the two enduring rivals pulling the strings of their respective sides. Prompting and probing, striking forth with targeted and damaging intent. A 2-2 draw was eventually played out, accompanied by a simmering row over an alleged handling of the ball by Maradona for Napoli’s late equaliser; a striking portent of controversies to come a year later at the Estadio Azteca. In the summer of 1985 Zico returned to Flamengo, with one eye on the forthcoming World Cup and one eye on tax evasion charges in Italy. For the first time in his career, he suffered with extensive injury problems. Santana had a big decision to make about Brazil’s talisman. With pressure applied from most angles to select him, and Santana’s own sense of devotion, Zico was in the squad at the expense of other, fully fit options. In many ways, Santana was lucky that Zico clearly wasn’t capable of starting games at Mexico 86. The concept of the manager having to remove his fading star from the front-line never visited either of them. Zico had to accept he was fit only to play cameo roles. Having played no part during Brazil’s opening two games, Zico appeared from the bench against Northern Ireland and then in the last-16 win against Poland. On both occasions, the games were all but won by the time he entered the fray. The quarter-final was a different matter, however. With the game against France poised at 1-1, Zico was introduced as a replacement for Muller. Within two minutes he had threaded through the pass that provoked the French keeper Joel Bats to bring down Branco for a penalty. Just 17 minutes remained. Both Sócrates and Careca were on the pitch, scorers of a penalty each against Poland in the previous round, yet Zico took the ball. It was a poor penalty. Low and marginally right of centre, it could hardly have been at a better height for Bats to save. Once again, Zico was watching a strong World Cup position implode. Extra-time came and went, before the inevitable defeat by penalty shoot-out, with the added irony of Zico this time succeeding from 12 yards. 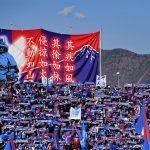 It was a bitter pill to swallow, and Santana’s vision of a modern World Cup being won by virtue of playing the samba style of the dispersing old world methods was gone forever. For both Zico and Santana, it was the end of the line with the Brazilian national side. Three more injury-hit years at Flamengo followed before Zico retired. It would be a temporary end to his playing career, however. A return to the game in the early-1990s burgeoning outpost of Japan brought an unexpected Indian Summer. The goals flowed until a second and final retirement from playing came at the age of 41 in 1994. Zico’s standing in the game brought a flood of coaching opportunities the world over, with the peak coming when he undertook one last World Cup adventure in charge of Japan at the 2006 finals in Germany. Preaching a short passing game, Zico’s Japan won plenty of admirers but no games, taking just one point in Germany. Zico continues to influence captivated audiences to this day. His is a career of high individual talent, coupled with collective successes during his time with Flamengo, but offset by the frustrations of what might have been – perhaps what should have been – in the yellow shirt of Brazil. Along with Lionel Messi, Johan Cruyff and Ferenc Puskás, Zico lives alongside the greatest players to be denied a World Cup winner’s medal.